I wrote this seven years ago today, upon the birth of my daughter. Today she celebrates her seventh birthday. Such a big girl. It was at this point that both us fell into an “I told you so” situation. For me, I doubted that your mother was experiencing contractions, since the brutal, possibly hedonist midwife earlier that day had told me that there was “no mistaking contractions.” Since you mom said that she thought it might be contractions, I assumed that she was experiencing cramps and that we should probably not go to the hospital yet. Your mother, in a bit of a panic, insisted that we go and refused my suggestion to call the doctor first and bring Kaleigh to the Casper’s house before heading off. Less than fifteen minutes later, she was on the phone with the doctor, and for a moment, she was wishing that the Caspers weren’t already on their way to our home. Oh well. Mommy and Daddy aren’t always perfect. After loading up the car and waiting for Jane to arrive to pick up Kaleigh, we were off, leaving the house at 12:30. Seven minutes later, we arrived at the hospital, and I dropped Mommy off in order to park the car. I said, “Don’t wait for me. Just go up.” She replied, “There’ll be no waiting for you” and exited the car. I admit that I secretly hoped that by the time I made it up to the sixth floor, you would be well on your way out. Mommy was filling out paperwork with a nurse when I arrived in the delivery center, and it was at this time that I finally understood the degree of Mommy’s pain. As she was being asked questions, her responses were not very coherent. Of course, her contractions were coming every three to four minutes, which explains the pain. After being led to our room, we met Cassie, the first of two nurses who we would come to adore throughout the process. Cassie was with us throughout the evening, making us comfortable and helping us to catch a few hours of sleep. After arriving, we learned that Mommy was almost entirely effaced but not dilated at all. We were shocked. On the way over, we took wagers on how dilated she would be. She said 4 centimeters would make her happy, and I was hoping for 7. Thankfully, our humanitarian doctor, who doesn’t believe that women should ever suffer through childbirth, offered to administer the epidural immediately, even though birthing class instructors informed us that it would not be done before 4 centimeters. This was the first of what we discovered to be several false statements made by birthing class instructors, including their assertion that the hospital had no Wi-Fi, which I am using at this moment. I left the room for the epidural (though Cassie said I could stay, which my birthing instructor said would never happen), and even though Mommy hasn’t said much about it, it seemed to go well. The anesthesiologist was a bit of a jerk, but otherwise, the needle, the meds, and all the horrifying aspects of this procedure went off without a hitch. Mommy was terrified during this process, possibly more than any other time in her life, but she held up like a trooper. With the epidural on board, the pain vanished, the lights were turned off, and Mommy and I managed to sleep for a couple fitful hours. The chair that I attempted to sleep in was a device that harkened back to the Spanish Inquisition in terms of its torture on my neck and back, but later I found the wisdom to open it into a bed and sleep soundly for an hour or two. 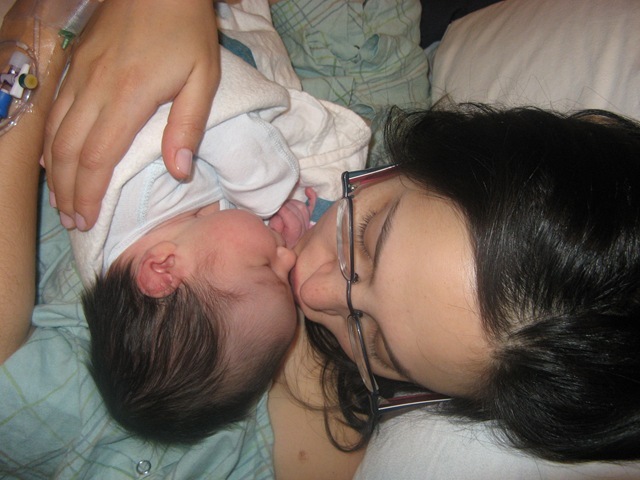 We slept from about 2:00-4:00, when Cassie checked Mommy again and found her fully effaced and 4 centimeters dilated. Lights went out again until 6:00, when Cassie checked and found Mommy fully dilated. Hooray. I expected a baby before breakfast and said as much. She began pushing at 6:30, but in the midst of a shift change, in which Cassie left us and Catherine took over, it was decided to allow you to drop some more on your own before resuming to push. When Catherine first appeared, we didn’t know who she was, but being the woman she is, your mother immediately requested her name and rank, and we learned that Cassie was leaving us. Cassie was wonderful; an easy going, friendly, and warm woman with three young kids of her own who was perfect for helping us to rest and relax during the night. Catherine was warm and friendly as well, but she was also a bit of a drill sergeant, specific and demanding in her orders, and it was just what your Mommy needed when she began pushing again around 8:00. This was the hardest time for your mother. She pushed consistently from 8:00 until 11:30, but because of the placement of your mother’s pubic bone and the angle of your head, you simply would not come out. The vacuum was attempted briefly, but at last, it was determined that a c-section would need to be done. Several times, Catherine encouraged Mommy to find some anger with which to help push. “Get mad,” she would say. “Find something to be angry about.” Your mother continually asserted that she had nothing in her life with which to be angry. Finally, Catherine acknowledged that she was dealing with the sweetest person on the planet. Your mother never yelled at me and never uttered a single word of profanity during the entire process. Throughout the pushing, I was receiving and sending texts to your grandmother, Justine, and Cindy, who were all dying to find out what was going on. I also managed to update my Facebook and Twitter accounts throughout the morning. When the decision was made to extract you via c-section, things got fast and furious and I left your mom for the first time today in order to don a pair of scrubs while she was rolled into the operating room and prepped. It was at this time that I was forced to remove my Superman tee-shirt, which had been specifically chosen for the event. I wanted your first glimpses of me to be reminiscent of the man of steel. The best laid plans of mice and men. When I entered the OR, the doctors were already working on your mother, and I inadvertently caught a view of her before I was ushered to a stool behind the screen and told not to move. Yikes! “It looks like… a girl,” he said, and immediately thereafter, the docs behind the screen began asserting the same. We began crying while we listened to your cry and caught our first glimpses of you as a nurse was preparing to weigh you. A couple minutes later, after managing a 9/9 on your apgar scores, you were handed to me, the first time I have ever held an infant without the protection of a sofa and many cushions. Because of the position that Mommy was still in, she wasn’t able to see you well until Catherine finally took you from my nervous arms, flipped you upside down like a football, and held your face to hers. Your mom was forced to remain on the table, arms outstretched and pinned, for more than an hour while the doctors stitched her up. She began to go a little stir crazy for a while, unable to move and shivering uncontrollably, and we tried to calm her by massaging her shoulders and rubbing her arms. Eventually the surgery ended, and you were finally handed to Mommy. The two of you were rolled into Recovery while I had the pleasure of telling your grandparents, Aunty Emily, and soon-to-be Uncle Michael all about you. There were many tears. Your grandfather laughed, your grandmother cried, and in keeping with her character, Emily was indignant over her inability to see you and her sister immediately. It’s almost 9:00 PM, and we are now sitting in our room, resting and chatting. You are asleep and have been for the past few hours. I must leave soon in order to go home so that I can teach tomorrow and use my time off when you and your mom are at home. My students will be thrilled to see your photos and hear all about you. For your mother, the three plus hours of pushing were her greatest challenge of the day. For me, the greatest challenge will be leaving this room tonight and not taking you with me. I want nothing more than to hold you in my arms for the next week. We love you so much, little one. Welcome to the world.